As I get ready to be the guest tonight on Michele Price’s #speakchat Twitter chat, I’ve been thinking about building a speaking career. There are lots of thoughts swirling through my mind. I hope these help encourage you at whatever step you are in the process. When you’re speaking, you’re getting to help a lot of people at the same time. 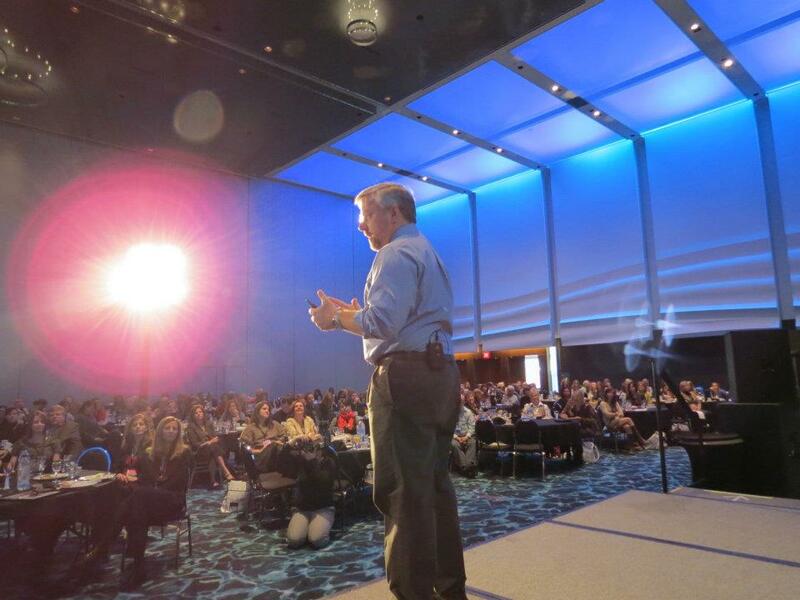 As a speaker, you get to travel to various locations (not that you stick around long enough to see the sites!). The very act of speaking at conferences and to teams gets your name out to other people who might want to hire you. Groups love having speakers promote their sessions. And speakers should because it lets prospects know what you do and that you like doing it! Speaking is well suited for other types of products. You can record your talks and sell them as CDs and digital downloads. You can get videos of your talks and sell them as DVDs or downloads. And you can write out your talks and seminars to create blog posts or ebooks. Speaking is incredibly fun. You get to come into a place, share helpful ideas, remind people how great they are, and then go home. Any follow up is another type of income! In my fundraising book Ask Without Fear!, I encourage people to raise money with a four step strategy: reasearch, engage, ask, love. Let’s see how this works with speaking. First you need to know what you know. What are you good at talking about? And why you? What is your unique “point of view”? Why will people hear you? Then you need to research where people are looking for something like this. It’s really helpful to have a specific niche. You could talk about sales training, but you will have better results if you speak to a specific type of sales. Cell phone sales in retail locations? Anything. You know if you have a good niche if there are already associations, conferences, and events supporting that same niche. Pigeon holing yourself to a niche is probably the hardest thing for us as speakers. We know that we can help everyone with our topic. But no one hears something pitched at “everyone.” They start listening as you target them. All my goal setting and leadership expertise wasn’t worth anything to “everyone.” But as I focused on helping nonprofit boards raise lots of money, people started hiring me. The funniest thing to me is that once you specify a niche, people from other sectors will bring you in too! The most out-of-niche gig so far was speaking at the Bowl Expo in Las Vegas. But you know what, nonprofit fundraising has a lot to do with owning a bowling center! Get to know the people both who’ll be hiring you and who’ll you’ll be speaking to. What are they currently talking about. What has their attention? Social media? A new gadget? See if your talk can incorporate that. Do all you can to ask to speak. As much as I hate them, I am a sort of fan of cold calls. Really. I find the more cold calls I do, the more calls I get from people actually looking for speakers like me. I’m not sure what it is, but I’m not messing with what’s working! One form of “cold call” I do I call a my conference rescue. If you’ve ever organized a conference, you know that speakers always drop out at the last minute. So I call or email offering to help. If they’re interested, we talk about the topic (usually you have to take what they’ve already been publicizing). Then you talk about the fee–in addition to travel expenses. I tend to offer to come down on my rate for the conference rescue folks. Thank the people that hire you, the people that listen to you, and anyone else along the way. Thank them publicly on your blog and privately in notes and emails. One way I show love to attendees is to offer something of value to them. I usually offer to email my PowerPoint slides to them after the session if they give me their business card. That allows me to follow up with them. They start out speaking at conferences they were already planning on going to. Then they get free registrations to those conferences. Then they get some travel reimbursement and the conference registration. And somewhere along the way, they start naming a fee in addition to travel. I remember the first time I named a fee. I’d been speaking at one industry conference for years. I did it for free but they comp’ed my registration. And I always landed at least one paying client from the gig. Then one year, they wanted me to speak at a conference I wasn’t planning on going to. A free registration to a conference I didn’t want to attend had no value. And I told them so. I worked up all the gumption I could and told them my fee for that session was $500. They ended up paying it, in addition to the hotel and travel. I now get more than 10 times that amount for the same talk, but that first $500 ask was one of the scariest in my life! Pricing is an odd thing. People really feel they get what they pay for. So there is a prestige in paying more for a speaker. A really odd thing I’ve noticed is that people tend to do the things I say if they’ve paid more to hear me. I could say the same fundraising strategy at a free Rotary talk and be completely blown off. But if I say them as a $7500 keynote, people actually act on what they hear. And when they act on what they hear, they end up seeing positive results. The most important advice on setting a fee I can offer is this: don’t be the Walmart of your sector. Being the cheapest option is a losing proposition. It’s far easier to set a boutique price and negotiate down, than it is to set a low price and try to negotiate up. Every day, people are desperately seeking speakers to fill their conferences and club meetings. How do you find them? Here are some places to find your first gigs. I often knew the organizers or was an organizer myself, so I started here. I have no experience with this group but people say they’re pretty amazing. When I moved back to Maine, I noticed our local community college did a lot of trainings-in-a-box things for companies. You know, curriculum like “Fish” or Ken Blanchard stuff. So I contacted them. They asked me to create something for nonprofits. Those seminars later became the foundation for my first published book. Many communities have local associations, women in leadership groups, Christian leaders groups, all sorts of leadership groups. See if they’re interested in your topic. I’d steer clear of speaking bureaus. I’ve found speaking bureaus to be more interested in me paying them for a listing than in getting me gigs. Plus, if my listing were found on their site, they’d take a huge chunk of the fee! I decided to make my website really easy to find instead. My first gig came from an article I wrote about the way I did my work. I really didn’t think it was anything special, didn’t everyone see the world like I did? But it turns out my point-of-view was unique and something people wanted to learn more about. Viola! A seminar was born. It used to be that you had to spend lots of time submitting writing to magazines. I’d encourage you to do that, but now you can publish your writing on a blog and start building your own platform too. People that may need you may not need you when you first meet them. So start an email list that will help you stay in front of them. I like my every other week email newsletter. Every other Tuesday was a rhythm I could keep up with. Since you already have a niche, you can offer something of value to that group. I offer a free article on some aspect of fundraising in each issue. What could you offer? I’m not a whiz at web design, but I do know that dancing cats and confusing fonts make you look like an amateur. My fundraising training site is based on a free WordPress template. I hired a web designer to tweak that template to make it mine. Now everything looks consistant and professional. Be specific with the keywords you use for SEO (search engine optimization). Every self-proclaimed SEO guru was trying to convince me to hire them to get me in the first page of results for searches on “fundraising” or “fundraising ideas.” But I knew that was a waste of time. One search on either term showed that people searching for “fundraising ideas” were looking for popcorn and gift wrap. So I decided to target searches like “fundraising training” and “fundraising webinar.” Those were things that people expected to pay more for. And people searching on those terms were much further down the sales funnel for me. Does this work? It sure does. Less than a year ago, some conference organizers in Mexico typed “fundraising training” into Google. My page came up on the first page and looked the most professional. As a result, this guy from rural Maine was flown down to give the keynote for the World Fundraising Summit in Monterrey, Mexico. I have found speaking to be incredibly rewarding. I hope this post helps give you some ideas to get you started on a speaking journey! Please use the comments to let me know what you would add to this post! How many times have you practiced your routine? Marc you were brilliant tonight during #speakchat, being that “guy” I met at Blogworld you have such a heart combined with such expertise. Thank you for sharing with our community your knowledge. Looking forward to speaking on stage together soon! I would like to follow up on your mention of Toastmasters. It’s a public speaking club that offers a chance to practice and get feedback. If you have any hesitation getting in front of crowds, you should join Toastmasters. It’s a very safe, friendly environment that will build your confidence in your speaking skills. And then the work that Marc describes is not a stretch for you. Marc, Thanks for this great post! One of my goals for 2012 is to get started doing more speaking about the work I’m passionate about and “putting myself out there” as a speaker. This will help me do it! Thanks! Next Next post: Are you his father?